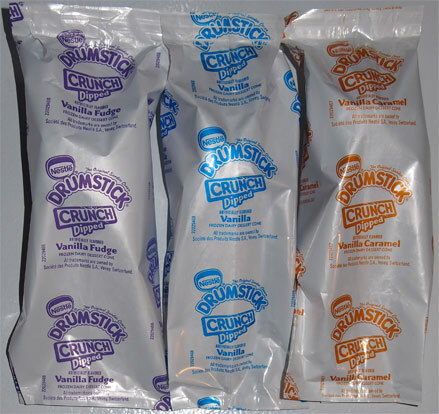 [New for 2013] Drumsticks (and other cones) will always have a special place in my heart stomach. It's like going to a scoop shop but without all the driving. Now, factor in fond childhood memories of my grandfather bringing me a Nestle Crunch Bar (and a fresh loaf of rye bread) when he visited every week, and now we've got the possibility of an awesome treat. 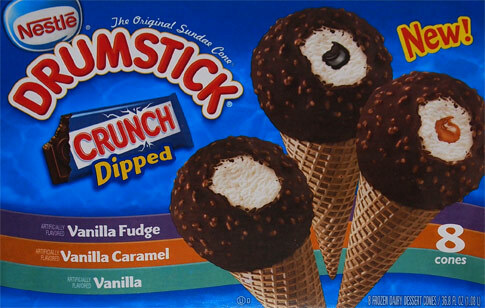 Here is the 8 pack box of the new Nestle CRUNCH Dipped Drumstick sundae cones. We've got 3 Vanilla, 3 Vanilla Caramel, and 2 Vanilla Fudge treats in this box. I take one bite and.... HAHAHAHA, Cool! They have indeed tweaked the chocolate shell so that it tastes like a Nestle Crunch Bar. That is too funny. I thought this was going to be a gimmick but they've gone and taken that extra step to make this a truly different product. Nice job Nestle, nice job! Why yes, drumsticks are incredibly hard to cut in half. So I started with the caramel. It's not some big whopping core of caramel craziness, instead you get a bit in every bite, and that bit is enough to accentuate the flavor of the crunch and the cone. It's probably my favorite of the three. Next I tried the fudge version. Rather than accentuating the flavors, I think fudge mutes everything a little. It's basically the chocolate coating + chocolate center + chocolate lining all blending together a bit. I think it winds up being the simplest of the three. Oh, I also made the mistake of inhaling this thing right out of the freezer. The crunch shell needs a moment to temper so that it tastes more like a standard CRUNCH candy bar. Last I tried the vanilla... on my way to work... what? it was hot. Anyway, out of the three, this was the only time I really noticed the vanilla flavoring of the frozen dairy dessert filling. Oh, I know I don't really like frozen dairy dessert, but Drumstick still makes it work somehow. I really liked this cone and it was just a fun way to start my day. So, a treat named after a candy bar that tastes like said candy bar? Yeah, that's get the second scoop seal of approval. Next time you see these, give 'em a try. Allergy note: while these aren't covered in nuts, nuts might still be present. There's always a good excuse to try a novelty and it's good to know this ones are actually worth a shot! Hope to find these soon! Have you tried the Peanut Butter drumsticks? I think they're only available at Walmart. Tried them once, SUPER GOOD (especially the one that's completely peanut butter inside). I don't see the peanut butter ones very often, but sooner or later I will give them a shot.